The Rebel Sweetheart. : Join | HGTV Home Furniture Giveaway! I've been posting about homes, gardens, home improvement ideas, gardening tips and tricks, but what? No home improvement-related giveaway yet on this blog?! I realized that not too long ago, and so I'm joining Cheap is the New Classy and HGTV Home Furniture in bringing you this next event. 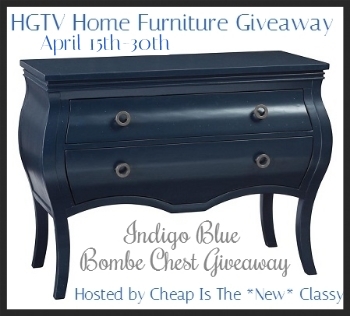 where we'll be raffling off one beautiful Indigo Blue Bombe Chest! This event will run from April 15-30, open to Continental US only. Enter the giveaway via the Rafflecopter below. Have fun, and good luck! I would choose Indigo Blue, because I love the color, but also the handles!